Last weekend, after having rediscovered some music that I hadn’t listened to in years, I declared it the summer of music. based on the quote above. And so, let it be. which is one of my favorite song titles, ever. And a favorite song, as well. are back together for a new album. This entry was posted on Saturday, May 12th, 2012 at 9:21 amand is filed under . You can follow any responses to this entry through the RSS 2.0 feed. You can leave a response, or trackback from your own site. you know i’m there already. Gorgeous, I do so love your photography! Fantastic! I am so ready to dance 🙂 This would make a beautiful print…which would, in turn, look amazing hanging on the wall of my blue room…just saying! Did you say “dance”, count me in…. 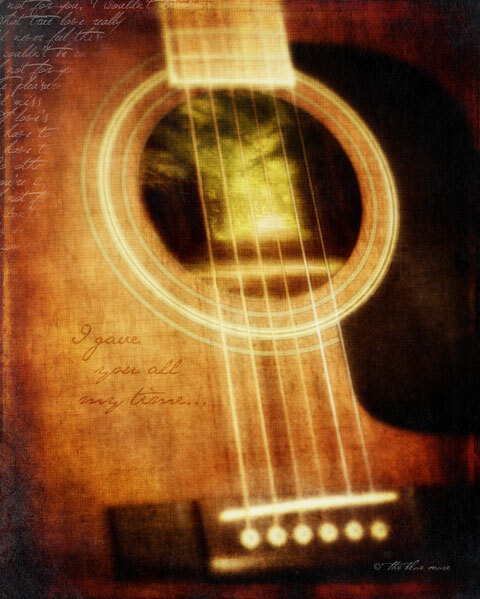 that is a very cool song…and a very cool pic..love the pic in the mouth of the guitar and all the written texture too…cool…hope you have a happy mothers day! Thanks for entering your response (image & written composition0 to our WWUC…I thoroughly enjoyed it! Along with learning “Dead Can Dance’ we coming back together. “Lets dance,” shades of David Bowie! PS: Gave you a Google+ but not sure if it went?